Daily Khabroon Sindhi Newspaper is one of the biggest News Paper prepare and issue from Sukkur, Karachi, Hyderabad and Islamabad. It is a Sindhi Newspaper.Daily Khabroon Sindhi Newspaperrepresents the oppressed people wherever they are publicly known. It is a fastest Newspaper provides Breaking News, Business, Culture, Politics, Columns and much more. The Chief Executive of newspaper is Zia Shahid. You Are Visiting Daily Khabroon Sindhi Newspaper Page of Epaper.PkNewspapers.com. 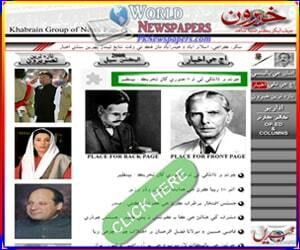 You Can read Daily Latest News On it.